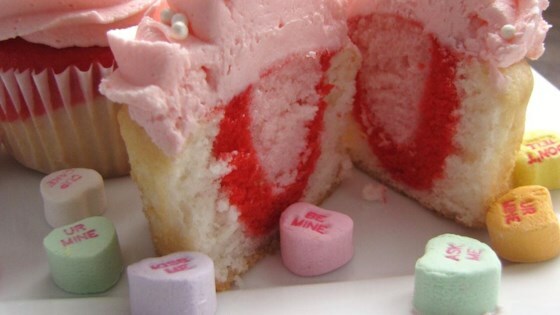 "Instead of just plain white cupcakes, I took it a step further and made them special. You can change the colors for any holiday. Shades of green for St. Patrick's Day, pastel colors for Easter, red white and blue for the 4th of July. You get the picture." Top cupcakes with your favorite frosting. I used Sturdy Whipped Cream Frosting from this site. These look wonderful. Unfortunately, they taste like you made plain white cake which is just what they are except food coloring has been added. won't make again. These are soooo cute! I'm going to mix in some strawberry extract with the pink batter for a more unique flavor!